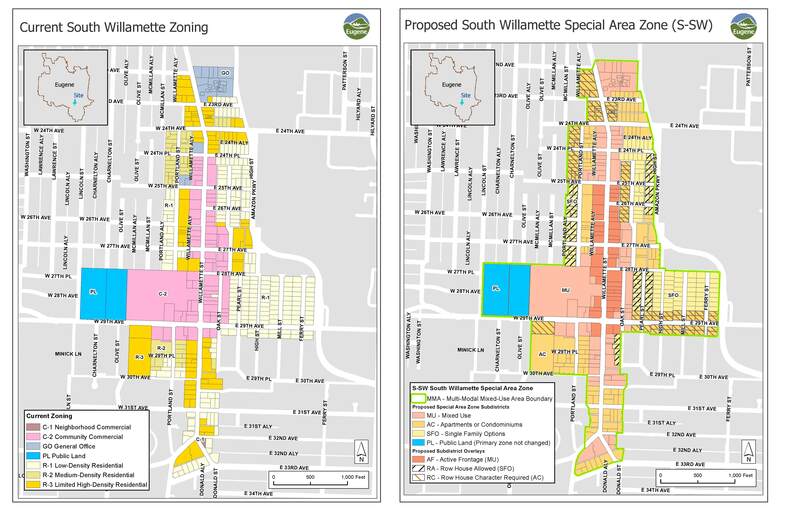 The Eugene City Council will hold a public hearing on October 19th to the proposal to create a South Willamette Special Area Zone. At the hearing, citizens can express their opinions about the long-range plan that covers the area from 23rd to 32nd Avenue roughly between the base of College Hill and Amazon Parkway. If approved, the plan will redefine the forms of buildings that will be allowed within the area. That will mean lowering allowed building heights in some areas and raising them in others. The City Club’s September 18th program reflects the great interest in the controversial proposal. Bill Randall helped craft the plan as a Eugene Planning Commissioner. The Planning Commission advises Eugene’s City Council and the city staff on a variety of policy matters. Randall is a local architect who specializes in energy efficient sustainable design. Andrew Fisher, chair of the Friendly Area Neighbors will ask the first question. Then City Club members will engage the speakers in a Q&A session. City Club of Eugene programs are now being aired on Community Television of Lane County (Comcast channel 29) Monday through Friday at 12:30 pm, Saturday at 10:30 am, and Sunday at 9:00 pm. For more information contact CTV29 at 541.790.6616, http://www.CTV29.org or email: info@CTV29.org. Use the links below for more information on zoning and design code updates within the Special Area Zone. September 17, 2015 in Land Use, Meetings, Neighborhood Issues.